This fine turmeric powder blend is ideal for golden milk lattes and can even give your smoothie an extra kick. A wonderful refreshing digestive tea with the zing of lemon and the sweet heat of ginger folded into a rooibos base which means caffeine free. This sleep tea has heavy hitting relaxation herbs including St. John's Wort, passion flower, hops and valerian to help ease you into a deep restful sleep. Organic apple, rosehip pieces, hibiscus petals and natural cranberry flavours produce a bright full flavoured cup - not just for grownups, great kid's tea too! A nutty sweet treat. Enjoy this smooth delicious blend of almond, apple and beetroot. This beautiful red tea is tasty warm or iced. Cold pressed bergamot oil infuses peppermint and spearmint with a subtle citrus vibe. Refreshing and soothing at the same time. 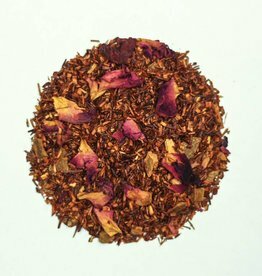 The combination of cinnamon and vanilla blended with organic rooibos make this a beautiful tea to have after a big meal. It settles your tummy while blissing you out with it's smooth, slightly floral flavour.